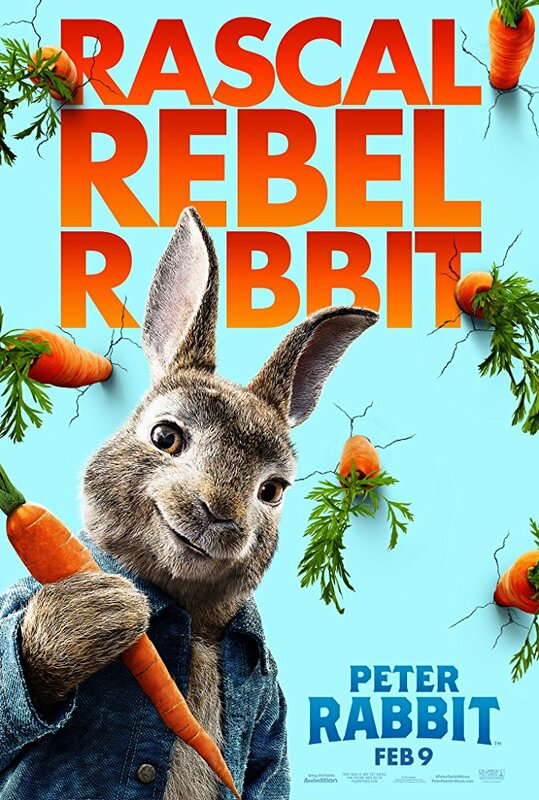 Plot: Peter Rabbit and his bunny relatives Flopsy, Mopsy, Cottontail, and Benjamin fight with the newest Mr. McGregor over access to the farmer’s vegetable garden, and for the affections of neighbor and animal lover, Bea. Child Enjoyment: 8/10 The child was mightily amused. Parental Enjoyment: 5/10. It’s a movie about rabbits and a toy-store-employee-turned-farmer beating on one another. So…the child was mightily amused. Age Appropriate: It lived up to all of the six-year-old’s expectations – lots of physical humor (which he loves) with very little actual suspense (which he hates). The nominal love story is exceedingly chaste, and no one said anything I wouldn’t want the child repeating in public, so I also deem it appropriate. Pain Factor: I mean, it’s a story about rabbits and an English guy locked in mortal combat over access to a vegetable garden. The child was enthralled. I fought the urge to check my phone. Story Assessment: Some rabbits want to get into a garden yadda yadda yadda. Hijinks ensue. Do we really care beyond that? I didn’t think so. Conclusion: It’s fine. The child finds it uproarious. I find it inoffensive. The CGI bunnies are cute. I guess we’ll call that a win.